The word bluestocking refers to an educated, intellectual woman. The word originally referred to people of both sexes and became prevalent in the 18th century. The idea was that bluestockings wore blue, woollen stockings instead of the fashionable black or white silk stockings of the day. This was presumably because their minds were on higher matters than mere fashion, and it must be said, the word was not used (nor intended) in a complimentary way. I suppose the original bluestockings were the geeks or nerds of their day. Female bluestockings were deliberately sidestepping societal expectations: instead of getting married upon leaving school, they sought education, enlightenment and achievement on their own merits. Some people might not have noticed it, but many of you have just missed Bluestocking Week 2015. This event is run by Australia's National Tertiary Education Union (NTEU). Though the NTEU is open to membership from both sexes, the Bluestocking Week is all about celebrating the contribution of women to tertiary education. I chose the name for several reasons. First, I am all about words. Secondly, I studied in London in Bloomsbury, which was known for a particular group of intellectual women, the Bloomsbury Bluestockings. Thirdly, one of my favourite music groups recorded a beautiful song, Bloomsbury Blue, about just such a woman. In the song, the woman is referred to as Bluestocking Blue, and I liked the pleasant alliteration of that phrase, so I adopted it. I didn't intend anything to do with blue or blues in the emotional or musical sense. Finally, I have struggled to find other cross dressers with a similar outlook to my own, which makes me feel somewhat distinct from them. 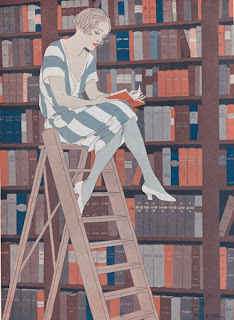 A scholarly, geeky, cross dresser: a bluestocking. I am an avid reader, an apprenticing writer, an active mediaphile, an adored wife, an annoying sister, an adept daughter, an adequate woman. I am an acquired taste. I must admit, as someone who adores words, and is also a writer, I cannot think of a more enticing profile entry. An acquired taste? Oh, I somehow doubt it would take long! It isn't possible, I believe, for a woman (or anyone) to be over-educated. Lauren writes fiction (something I am dreadful at), and her career seems to be taking off, with a string of successful publications. 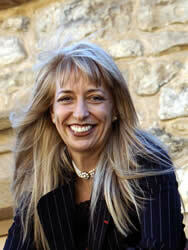 Her blog is insightful and interesting, and she has earned a string of "blogging awards". I haven't read any of her published work, though when I do I will be sure to let you know. My favourite mode of writing is in my journal, with a fountain pen on thick white paper. Writing in my journal is healing, and centering. I write for an audience of one, though I hope my children will eventually read all about Vivienne in my journals (which run to many volumes) and feel some compassion for their old dad doing the best he could with his weird affliction. Mostly I write, of course, to be read (doesn't everyone?) and to be read requires dissemination, which requires the Internet. A mentor of mine is fond of remarking "the shoemaker makes good shoes because he makes them every day". I think the same is true of writers. Good writers write all the time. I have personally found blogging to be really helpful: I can write on any one of several devices, in just about any location, and revisit or edit the material whenever I like. There's little to me that you should know - a romantic, finding her dazed way through life. A pragmatist who dreams of magic. Glimpses of both, you shall see here. And my thoughts, sometimes laid bare. I find myself jealous of the poetry in these profiles! 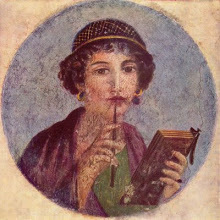 This woman not only embraces poetry, but uses Sappho as her avatar. She also has an "alter ego", Weaver Imp, whose blog consists of chapters of an ongoing novel. Bluestocking's blog consists of book reviews, snatches of fiction and poetry, self-reflective fragments and occasionally visual art. Bluestocking writes: come not here for pearls of wisdom. This place is simply my canvas. So much for individuals, how about groups? The Bluestockings Magazine is written by students at Brown University in the USA. It's not quite clear whether there is a paper version, or whether it exists only online. On looking at its website, I was surprised to find an article about Bradley Manning, who now wishes to be known as Chelsea Manning, and who has announced his intention to transition. The article is very sympathetic to trans people. On looking at the production team, there is a huge string of interesting biographies, with pictures of quirky, gorgeous, and above all, intellectual young people. And among them is a young man! Well done, Kyle. This team of young people reminds me why I find academic life so inspiring sometimes. We believe feminism is not a rigid set of guidelines or restrictive beliefs, but instead contains a fluid spectrum of definitions that can be negotiated through the creative process. It is a malleable perspective that is both personal and public. As you can imagine, with such a long list of contributors (and the magazine accepts contributions of all kinds), the output is copious, lavish and all-encompassing. I will be sure to have a good browse through the archive the next time I have a bit of time off. We are a feminist journal based in Oxford who publish insightful yet critical articles on the contributions of female thinkers over history. It focusses on "women as creative thinkers", and is resolutely, unapologetically, by women only, and about women only. It also seems to have a narrower, more academic focus. Its list of patrons includes one of my personal heroes, Susan Greenfield, whose seemingly inexhaustible output I have found in several media, not least my favourite radio station, BBC Radio 4. Greenfield is one of those ridiculously competent people who makes me think: I wish I was half as good as that. Wikipedia says she has been awarded 30 honorary degrees, as well as a CBE and a life peerage with a seat in the House of Lords. Let's see you top that! Greenfield's personal website is here. While I feel quite at home on the Brown website, which seems more open and more accepting of people like me (even Vivienne), I suspect in Oxford, I would be viewed as an unwelcome impostor and given a frosty cold shoulder.